Introducing Negative ions detox, Self-treatment System, to naturally revitalize your health! Have you ever wondered why we love to be by the ocean? It is an electrical field filled with negative ions, the same as the high plateaus and highlands. These negative ions heal our body as they uplift us mentally, emotionally and physically. With the right balance of negative / positive ions within every cell of your body, it helps to accelerated healing, pain relief, hours of energy, mental focus, pH balance, beautiful skin and much more. 'Discover why people who live in the Russia, Pakistan and Ecuador, where there are plateaus and highlands with the most negative potentials and negative ions, have the longest lifespan ... When people go walking with bare feet in the early morning, it can balance the electric potential in their body, normalize their ions field, in addition to improving their health. What is a 'Negative Potential Body Energizer'? Nutrients, oxygen and H2O cannot penetrate the cell. Waste and carbon dioxide remain trapped within the cell. The cell receives excessive sodium+/hydrogen+ A Negative Potential cell allows: Nutrients, oxygen and H2O to penetrate the cell. Waste and carbon dioxide are released. Negative potential activates the ATP (adenosine triphosphates) enzyme and aids the composition of the ATP. ATP's are energy carriers located within living cells. ATP is an energy essential to the the body in order for it to survive. A main cause of aging is due to lack of ATP. Why is there a need to do negative ions detox? Because of our poor diets, high stress, disease and frailty, we tend to accumulate and store excessive quantities of waste products. Since ancient times people have bathed in natural springs and reported experiencing healing benefits for many ailments. Resorts and health spas around the world maintain their popularity because bathing in springs — hot, cold or mineral — has undisputed therapeutic effects, including: improved circulation, increased relaxation and, as a result, relief from symptomatic or chronic pain. The ionic detox and ionizes footspa helps to detoxify the body and recreate the therapeutic experience found naturally in the world's most reputed spas. Negative ions treatment is designed to restore and balance the body’s energy , while facilitating and aiding the body’s natural detoxification process. It also helps to balances and restores the body’s Ph and electromagnetic energy.We use a reflexology stimulator before each treatment, encouraging the flow of energy throughout the body’s meridians. When using the negative ions detox/ energizer, negative ions are emitted by the machine, which re-energize the body. This type of machine is described as a Detox machine because the response of a rebalanced body is to excrete any excess toxins via the kidneys, liver, bowels and skin not only DURING but also AFTER treatment. Therefore you will experience the beneficial effects of a Detox experience. The entire process takes 30 minutes for adults and is completely safe to use. It is however, not recommended for pregnant woman, anyone with a heart pacemaker or an organ transplant. Since the body is composed of 70% water, it's ability to interact with the water is very high. 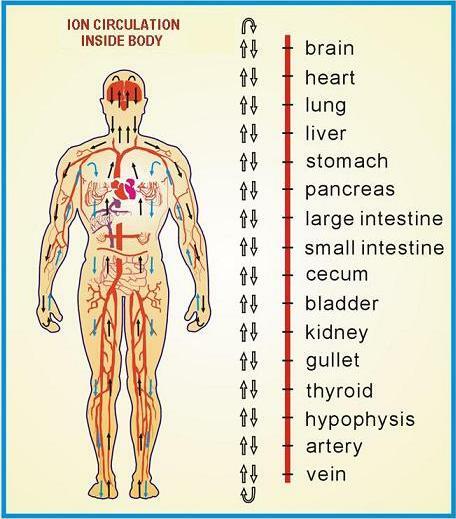 When you immerse a body mass into water, the vibration frequency of the water will affect the vibration frequency of the body due to the interaction of the magnetic & electrical field. It's an exceptionally wonderful and natural healing tool. It is a painless, actually relaxing, process and unlike prescription drugs, there are no harmful side effects. Studies show that an overall balancing effect occurs, along with a significant increase in the number of negative ions. Ions are atoms or molecules that have lost or gained electrons [Free radicals are unpaired electrons]. If the atoms or molecules lose electrons, they become positively charged ions. If they gain electrons, they become negatively charged ions. The ionic technique of cleansing thru feet provides a full body purge of all vital organs, resulting in reduced menopause symptoms, menstrual cramps, sexual health problems, skin problems, acne, sleep problems, restlessness, stress, toothaches, wrinkles, aches and pains and yeast infections. The internal cleansing can also assist in faster disease healing and injury recovery. The ionic footspa detox can be done by yourself or with a friend. We'll turn the lights down low, play some relaxing music, while you enjoy the heated massage chairs. Enjoy while the Ionic detox machine cleanses toxins from your body. Afterwards your feet will feel wonderful. We'll finish up with some peppermint spray. Wow, what a rejuvenating experience. Using Japanese scientist Yiteng Xianzhi's research regarding negative potential and high frequency, HTE created the E-Power machine which has since been approved by several renowned Japanese medical universities. It has had notable results in improving the functions of organs and limiting illness. E-Power Design Principals: The technology for negative Potential Energy and High Frequency Energy combines the theories of modern medical science, electronics, Traditional Chinese Medicine (TCM) and the biology of micro-molecules. E-Power increases the temperature of your subcutaneous skin, Negative Potential Energy spreads throughout the entire body, relaxing you and creating a balanced electrical field.